It is all about this crazy cute owl today. He is from one of the many amazing Unity Stamp Company sentiment kits. I’ve paired him with some fun patterned papers and a darling little sentiment banner accent. Lots of little details going on with this card. Did you notice the dandelion pattern watermarked on the kraft background? Those sweet little scallops and the pop of color behind the sentiment tag. All really easy accents that add lots of adorableness to this card. 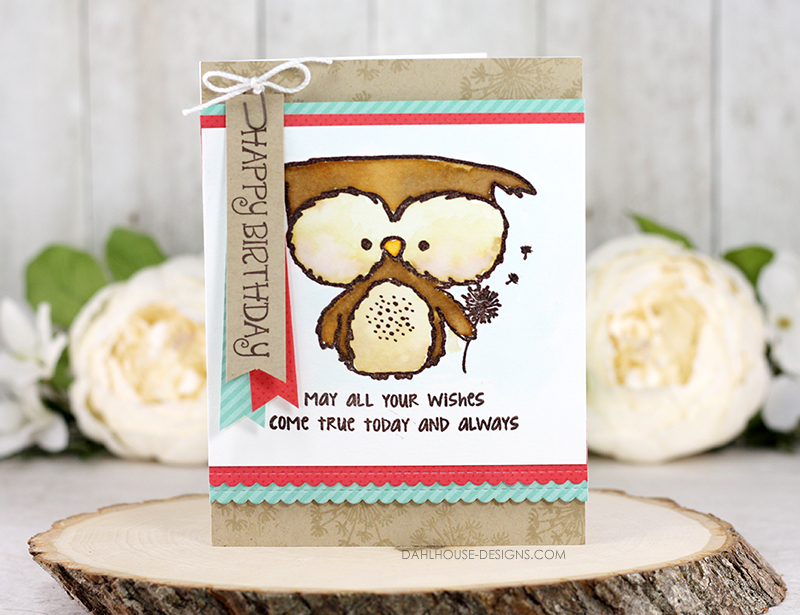 The owl is stamped onto watercolor paper and then heat embossed with clear embossing powder. I’m fully onboard with this technique. Just makes watercoloring that much easier if I don’t have to worry about going outside the lines. Start with a standard size A2 card (4.25″ x 5.5″) card covered with kraft cardstock. Stamp the large dandelions with a darker kraft color or Versamark ink along the top and bottom of the card. 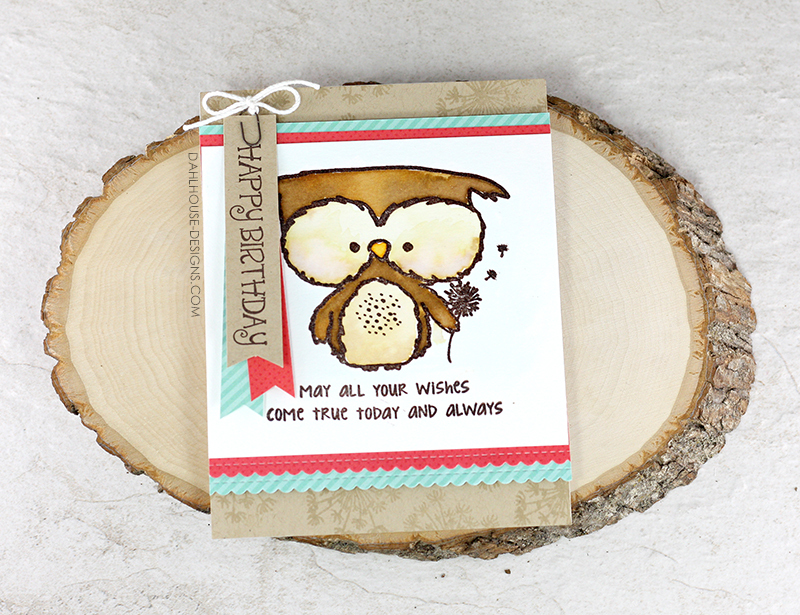 Stamp the owl onto watercolor paper and then heat emboss with clear embossing powder. Watercolor the owl with Distress Inks (or your favorite watercolor medium). Set aside to completely dry. Die cut pattern paper into two scallop borders. Adhere behind the owl panel and pop up on card front. Stamp sentiment onto a strip of kraft paper and notch out the end to create a banner. Add two more banner strips behind using some left over strips of matching patterned paper. Use a mini paper clip with a bow at the top to adhere banners to the top of the owl panel. Just look at your darling little card and send it to someone who needs some birthday wishes. Your watercoloured owl is a cutie for sure! I love the stacked banners down the left side. And even though there’s a lot of detail, everything works together perfectly.